To poach eggs, place in saucepan and add enough water to cover 1 inch above the eggs and bring the water to just below boiling point. Break eggs one at a time into saucer or cup and slip gently into water. Always poach eggs at the simmering point. Saute 4 artichoke hearts in butter and arrange on a platter. Heat mushroom puree and garnish the hearts. Top each with a poached egg and cover with a well-thickened Bechamel sauce. Sprinkle with Parmesan cheese. Brown in the oven and serve. Melt butter in a small, heavy pan. Blend in flour and cook for 2 minutes, stirring constantly. Combine the milk and beaten egg and gradually add this mixture to the pan, stirring well after each addition. Cook until thickened and smooth. Makes approximately 2 and 1/2 cups. Poached eggs over artichoke hearts and mushroom puree topped with a buttery Bechamel sauce. 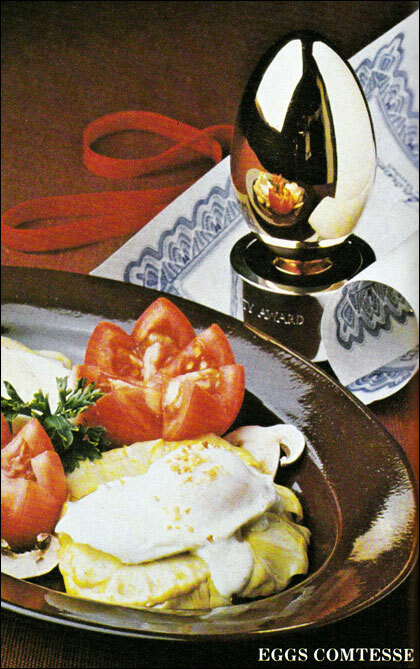 From the book Entertaining With Eggs. Recipe number 2971. Submitted 1/6/2011.